100% natural coconut water. Coconut water is the sweet tasting liquid found in young green coconuts. A refreshing way to naturally rehydrate the body. No added sugar, no preservatives, no artificial colour. 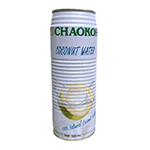 Ingredients: Coconut water (100%). Serve chilled. Shake well before use. Naturally refreshing, coconut water has a sweet, nutty taste. It contains easily digested carbohydrate in the form of sugar and electrolytes. Not to be confused with high-fat coconut milk or oil, coconut water is a clear liquid in the fruit’s center that is tapped from young, green coconuts. It has fewer calories, less sodium, and more potassium than a sports drink. Product of Thailand.